The 2014 theme for World Suicide Prevention Day on September 10th was “Connectedness”. The World Health Organization (WHO) in tandem with the International Association for Suicide Prevention (IASP) is stressing the need to acknowledge the crucial influence that social connectedness has on each individual. It is paradox of the times in which we live that the more we cluster in cities and the closer we live together, the more we become distanced from one another. This disconnection can have an enormous impact on the mental health of certain individuals, as some people might experience feelings of alienation or downright hopelessness. Despite being surrounded by others in this immense crowd of modern life, some may feel so completely alone that they think they are marooned on the moon. Taken to an extreme, these feelings of aloneness might lead someone to believe that their life really has no purpose. In this context, a meaningful connection with other people – or even one, single individual – can prove to be both life-affirming and life-saving. The more we cluster in cities and the closer we live together, the more we become distanced from one another. Best-selling author and New Yorker writer Malcolm Gladwell wrote Outliers: The Story of Success, which examines the factors that make an individual “successful: in western culture. He argues that one’s environment and community has a great deal to do with it. In the first chapter, Gladwell focuses on a unique small town that was formed in Pennsylvania in the early mid 20th century, which consisted solely of immigrants from a village in Italy named Roseto. What he found interesting about this specific town was the incredible therapeutic power the social connectedness ha don the health of its inhabitants. People started immigrating there in the 1890s, and an increasing number of Rosetans followed from Italy in the ensuing years. By the early 1900s, a transplanted duplication of the village had developed, so mush so that it was given the same name, Roseto. What was most interesting about this Pennsylvanian version, however – and what made it extraordinary among other American small towns of the same era – was the virtual non-existence of alcoholism, drug addiction, suicide, and crime. In the 1950s, a physician named Stewart Wolf heard about this miraculous place and found himself intrigued yet sceptical. What caught his attention in particular was that there were extraordinarily low rates of heart disease for people over 65, and no deaths due to heart attack for those under the age of 55. He found this fact more puzzling because, at the time, most places in the United States were experiencing heart disease at epidemic levels. Wolf soon discovered that the Rosetan’s high quality of life had nothing to do with genetics as relatives of these new citizens who lived elsewhere in the United States did not share their good health. And it was certainly not their diet as Rosetans in Pennsylvania ate as badly as the rest of America at the time. So what was causing such positive outcomes? What the physician had encountered was an example of what Gladwell calls an “outlier”, and defines as a place where “normal rules do not apply.” When the immigrant Rosetans recreated their Italian village in the United States, they simultaneously constructed a powerful protective social structure that insulated them from the pressures of the outside world. In other words, it was the power of the environment itself that created the success of the town. Gladwell concludes that community and connectedness—the values of the world we inhabit and the people we surround ourselves with—have a profound effect on the health of individuals (Gladwell, 2008). 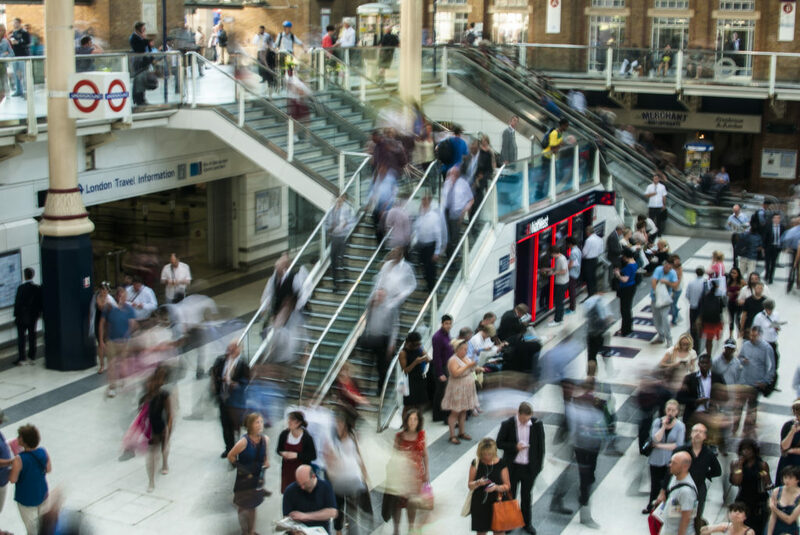 Research has shown that social connectedness is also associated with lower blood pressure rates, better immune responses, and lower levels of stress hormones – all of which contribute to the prevention of chronic disease. Social isolation, conversely, is considered a risk factor for multiple chronic diseases including obesity, high blood pressure, cancer, and diabetes. Most relevant to the present discussion, there is also a correlation between these physiological factors and the elevation of risk of depression (Ferris, 2012). As stated above, social connectedness has a huge effect on an individual’s overall mental health. The relationships we share with others are also a major protective factor for those at risk of suicide. Pioneering sociologist Emile Durkheim observed in the 1890s that suicides can result if individuals do not feel a sense of belonging, or lack a feeling of connectedness to others. He called this decrease in social integration “excessive individuation”, and defined it as a result of someone becoming increasingly detached from other members of his or her community (Durkheim, 1897/2006). It is refreshing to note, however, that social connectedness is now receiving the attention it deserves as a major protective factor of suicide. The Centre for Disease Control (CDC) has identified the “promotion and strengthening of connectedness at the individual, family, and community levels” as a key strategy in preventing suicidal behaviour in people of all ages (Centre for Disease Control and Prevention, n.d.). Connectedness, and the presence or absence of it, affects all age groups and all members of society. However, I want to look at two distinct demographics – middle-aged males and older male adults – to examine how it operates as both a protective and risk-factor for suicidal behaviours within these factions. In terms of numbers, most people who die by suicide in both Canada and the United States are men in the 30-65 age range. When they hear this statistic most people are very surprised. However, there are many reasons for this trend among men. From a very early age males are taught that being a “man” involves being stoic and heroic: keep your pain hidden at all costs. Boys are socialized to be strong and independent. One result of this attitude is that adult men tend not to seek help when they think they might be suffering from either/both physical ailments or mental illnesses such as depression or anxiety. This conditioned reluctance to get support often leads to some very serious consequences. Many men deal with major stresses by not dealing with them. They may ignore them entirely or engage in self-destructive actions such as abusing drugs or alcohol, being promiscuous, or engaging in other equally dangerous high-risk behaviours. Consistent suppression of one’s feelings can manifest itself through outward bursts of irritability, anger, or hostility (Ogrodniczuk & Oliffe, 2011). In extreme cases, some men will isolate themselves by avoiding social contacts and situations altogether. Albert is a 39-year old middle-management office worker who is recently divorced. The demands of his job are so great that he has no time for relationships beyond work. Indeed, his marriage was a casualty of his career aspirations. He feels that everyone at work depends on him, so there is no one there he can talk to or confide in; he is the bottom line. He feels he should be able to solve everything on his own but knows he can’t and doesn’t know where to turn. Even if he had someone to approach he is afraid to ask for help. He is incredibly stressed and feels trapped. Men’s pursuit of material and professional success will often cause them to discard friendships and support systems over time. Unlike women, who tend to retain stronger relationships throughout their lives, men may find themselves with no close connections or lose the ones they have as they get older. Unfortunately, this is often the time when these connections may matter the most (Joiner, 2011). Some males are especially vulnerable to Substance Use Disorder (SUD), as this is sometimes a major coping strategy for those feeling disconnected and alienated. An isolated individual with SUD and few or no social supports, is at much greater risk for major depression and potential suicide. Viktor Frankl believed that phenomena such as addiction, aggression, and depression could be caused by feelings of uselessness and meaninglessness. Addiction is also a potential response to this perceived lack of meaning, what he calls an “existential vacuum”. “Healthy” men, on the other hand, tend to develop deep emotional connections with others, have a sense of meaning and purpose in their lives, and are less susceptible to addictive behaviours (Frankl, 1988). Bruce Alexander has stated that addicted and alcoholic individuals often lack psychosocial integration, which leaves them more likely to experience co-occurring disorders such as anxiety or depression. He calls this the Dislocation Theory of Addiction, which states that individuals can be less prone to addiction if dislocation, disconnection, or isolation is reduced or prevented (Alexander, 2008). Phil is a 45-year old single man with no significant relationships. He was recently laid off as a shipper in a warehouse for being repeatedly intoxicated on the job. He angers easily and is extremely anxious and depressed when not drinking. Unemployed, he now drinks to excess often, mostly at home, alone, in his apartment. He has been thinking about killing himself, as living seems empty and meaningless. The ageing process guarantees with certainty the experience of loss in many different forms, irrespective of socioeconomic status, age, gender, or race. As we age we slowly lose our health, along with loved ones or friends, and our mobility and independence. A formerly strong and autonomous individual may find him or herself at the mercy of these circumstances, which are sadly beyond their control. As noted above, women fare much better than men in maintaining relationships and developing new ones. Women are more apt to seek-and-reach-out to others, and this continues as they get older. Older men, similar to their younger counterparts, rarely seek assistance when in crisis. Other factors that place older males at risk are: isolation/living alone which decreases the chance of rescue and survival in the event of a suicide attempt; greater frailty which increases the likelihood of dying as a result of self-inflicted injury; a tendency to use more lethal means of suicide with greater determination and planning; cause of death may be less rigorously investigated than other age groups because coroners may conclude that death is due to natural causes, (this leads us to suspect that the instances of suicide in this group may be much greater than officially reported) (Conwell, et al., 2011). Men 65 and older have extremely high rates of suicide. In Canada they are second only to middle-aged males with a suicide rate of about 20 per 100 000. Comparatively, women in the same age range have a rate of about 1.7 per 100 000 (Statistics Canada, 2011). Psychological autopsies of older adult male suicides suggest that they were more likely to live alone than their peers, and were less likely to have a confidante, participate in community activities, be active in organizations, or have a hobby. They were far less socially connected than others aged 65 or older (Conwell, 2011). Thomas Joiner’s Interpersonal Theory of Suicide (2005) is applicable to all age groups, but is particularly relevant when looking at the suicides of older adult males. He believes that there are three factors which must be present for an individual to die by suicide. The first of these is a lack of meaningful connections to others, and a strain on or loss of previously solid relationships. Joiner calls this Thwarted Belongingness. The second factor, Perceived Burdensomeness, involves a feeling on the part of the individual that he or she is a burden to the world. They feel that they not only fail to make meaningful contributions to society, but that they are also a potential liability. Taken together, according to this theory, these two perceptions produce the desire for suicide. 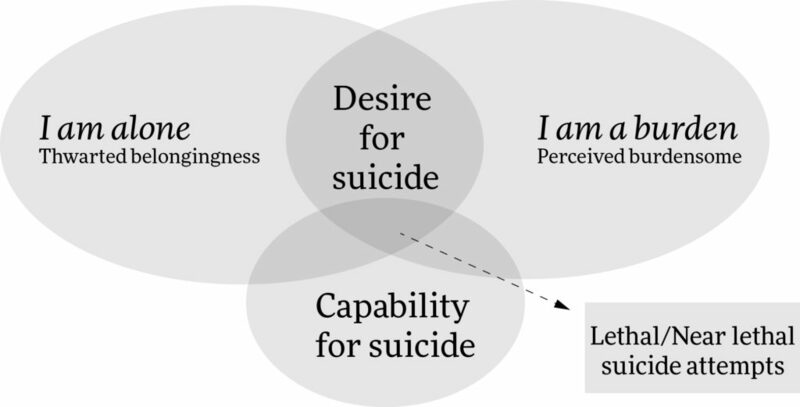 The third variable, Acquired Capability for Suicide, involves the degree to which an individual is able to initiate a lethal suicide attempt. Joiner posited that, because a lethal or near-lethal suicide attempt is fearsome and often pain-inducing, habituation to the fear and pain is a prerequisite for serious suicidal behavior. Repeated exposure to painful events and behaviours – such as self-injury- may de-sensitize a person to the fearful idea of suicide, and make the suicidal act easier to carry out. Connections to both other individuals and to their surrounding community may serve to protect older men against the progressive development of suicidal behaviours when faced with stressful life circumstances. Connections and relationships that fulfill an individual’s need to feel like they belong – ones that create positive social interaction and the feeling that they are cared about – are especially strong protective factors (Conwell, et al., 2011). John is a 68-year-old retired accountant. He lost his long-time wife Ruth the previous year. Since retirement, he has not kept in contact with former work colleagues and belongs to no clubs, has no hobbies, and does not attend church. He feels he is imposing when he asks his son for assistance in doing basic errands such as going shopping, as his ability to get around has been hindered due to ill health. He feels extremely lonely and depressed. He has, of late, been considering what methods of suicide might be the easiest, painless and most lethal. Maybe it is fanciful to even imagine that an “outlier” community, let alone an entire society, free from the perils of mental illness, could ever develop. However, Malcolm Gladwell’s illustration of the power of social connectedness cannot be overstated. Many men need to “get socially connected”. This is clearly evident from the continuing high numbers of suicide in both middle-aged and older men. The relative silence that this crisis receives in the mainstream media – and, sadly, in everyday conversation – echoes the silence of the suffering males themselves. Many men need to “get socially connected”. Establishing or re-establishing these connections is, of course, far from simple. A dramatic shift in thinking about what it means to be a man must occur and, with mass media and advertising providing the antithesis to this positive shift in every available bit of branded space, this is no small feat. A culture has to emerge where men are not only encouraged to seek help but applauded when they do so. We must see every individual’s effort – regardless of age or gender – to form relationships with others and make connections to their greater communities as a positive sign of strength as opposed to a negative sign of weakness. Men need to feel confident that they will not be humiliated or seen as vulnerable or needy when they share their feelings about stress, depression, or ideation of suicide. Starting this type of conversation should be seen as a responsible act from a man who is looking after himself. Ultimately, we need to re-think these old, tired, and stereotypical views of men and support a culture which allows them the means, ability, and dignity to build the strong supports and connections needed to weather the stresses of life. Conwell, Y., et al. (2011). Suicide in older adults. Psychiatric Clinics of North America, 34(2), 451-468. Durkheim, E. (2006). On suicide. (R. Buss, Trans.). New York: Penguin Books. (Original work published 1897). Frankl, V. (2006). Man’s search for meaning. (I. Lasch, Trans.). Boston, MA. : Beacon Press. (Original work published 1959). Joiner, T. (2005). Why people die by suicide. Cambridge, MA. : Harvard University Press. Joiner, T. (2011). Lonely at the top: The high cost of men’s success. New York: Palgrave Macmillan. Ogrodniczuk, John S. and Oliffe, John L. (2011). Men and depression. Canadian Family Physician, 57(2), 153-155.